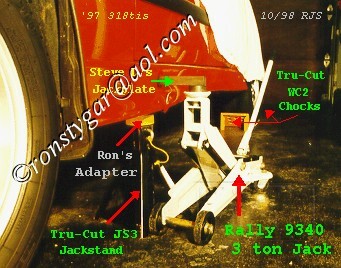 When I'm jacking the car on a hard level surface I use the following procedure.If I'm jacking just one wheel, I use Steve's jack plate and a jack stand equipped with my jack stand adapter under the BMW hockey puck like lift point. To do this you need a jack that will jack high enough. I also modified my Tru-Cut jack stands to allow them to be two inches lower. This way you don't have to get the car as high to place the jack stand. To get the front two wheels off the ground, I double chock both rear wheels using Tru-Cut WC2 wheel chocks which I modified by chaining each pair together using chain and 1/4 - 20 hardware. I also leave the car in gear and apply the emergency brake. 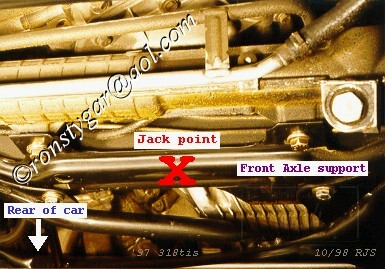 I then jack the car at the front cross member just forward of the oil sump and place the car on my modified stands at the front BMW hockey puck like lift points. 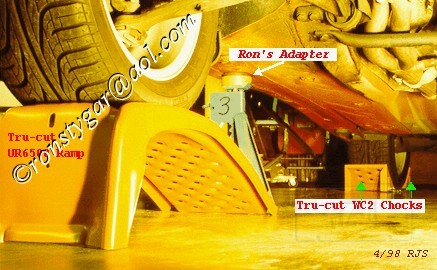 If I'm not removing the front tires, I also place my Tru-Cut UR6500 ramps under the front wheels as a backup. For raising the rear, I place both pairs of wheel chocks at the front wheels. I then jack the car at the cross member just forward of the differential and place my modified stands at the rear BMW hockey puck like lift points. As above, I also use the ramps as my backup. To place the car on four jack stands I do the front first and then the back. Make sure you don't place yourself between the car and a wall, or your garage door when jacking the back. A fellow in the next town placed the front of his pickup up on ramps. As he jacked the back the pickup rolled off the ramps pinning him to his garage door. He won't be doing that again. Although this is not as likely to happen with stable jack stands, I keep this in mind based on his experience. 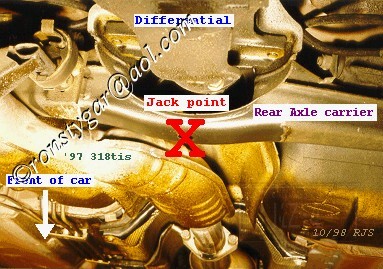 You can change the differential fluid without jacking the car unless you are very large. For the transmission fluid (although an inconvenience) my local gas station places my car on his lift for $15.00 and lets me do the work. In my opinion that's easier, and less of a risk, than four jack stands.